They just don’t come any sweeter than Gaelyn. 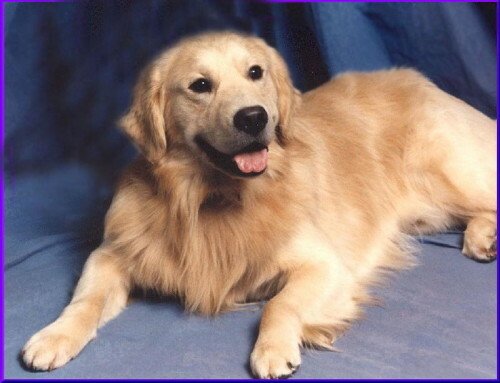 He was a great source of comfort as a puppy and has always had an unlimited supply of affection to give. 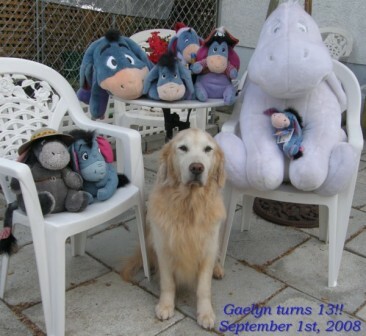 It took me years to figure out that my Eeyore collection was in honour of Gaelyn. They share the same soul. We dabbled in showing and he earned three points before I decided it wasn’t our place to shine, earned a TD in spite of himself and turned out to be a surprisingly good obedience dog as he turned in some nice scores earning his CDX. After that it seemed that he really should work on his CPX (Couch Potato Excellent) and he has enjoyed being the old man around the place for some time. He frequently tunes up his amazing yodelling voice and the entire choir joins in! You haven’t lived until you’ve been serenaded by this crew. Yesterday someone who seemed as if he would always be here passed peacefully to the Rainbow Bridge. I’m sure Summer, Rio, Shaya, Flyer, Scarlett & Vienna were all waiting to greet him. Almost fourteen years ago I kept the puppy boy with the oh so handsome face because I needed someone to comfort me on when I suddenly lost his father, Rio. He was absolutely brilliant at that and I loved him for it. Over the years he bore a strong resemblance in personality to Eeyore and I have an Eeyore collection to honour him. Somehow he managed to find the glove at his first tracking test (it’s still a mystery), he earned a three point win at the dog shows despite the fact that his tail was tucked down (he hated being centre stage) and pulled off some brilliant work in the obedience ring despite himself. Through it all he showered me, and everyone he met, with love and affection. He was particularly good with small children and would oh so gently tell them they were wonderful, wagging his tail and singing softly to them. In his later years he took on the task of choirmaster. Striking up the chorus whenever I was on the phone or not paying attention. The neighbours told me that choir practice would take place every afternoon. Gaelyn would start, everyone would join in and then the entire chorus would abruptly end like the curtain came down. A few minutes later my car would pull into the driveway. Gaelyn was probably most famous for his ability to ingest foreign objects. 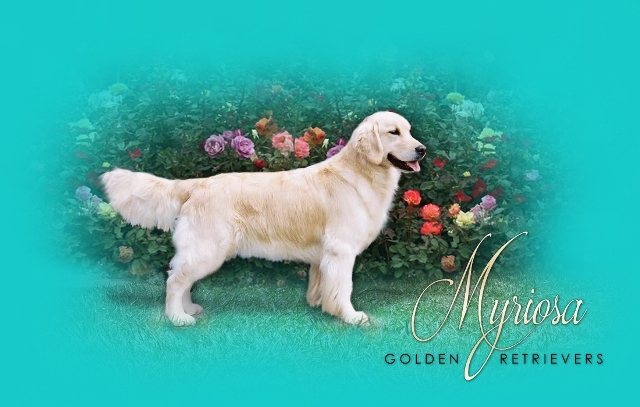 At about eight months old he swallowed four Easter egg sized rocks. Off to the vet we went to see what the problem was. It was amazing that you could shake his body and hear the rocks banging together in his stomach. Miraculously the vet managed to get him to throw them up and avoid surgery. When he was around seven he ate the inside of a quilt and had his intestine cut open in eight places to have the batting taken out. Nigel tells me Gaelyn holds the record for this. Quite an accomplishment! Along the way he chewed up and consumed at least two pairs of eyeglasses, fished knives out of the sink to practice being a pirate, consumed many rolls of toilet paper and anything else he could fit in his mouth. Always frustrating, always charming and always here. The big dogbed in the corner sits empty today. There will never be another one quite like you Gaelyn. I miss you.